Forced to fend for themselves, Tristan and Aimee begin to forage for food and shelter. As they fight for survival, they grow closer. Despite knowing he's off limits, Aimee can't deny her attraction to Tristan. Tristan knows Aimee is the one woman he can't have. But how can he fight love when she's slowly becoming everything to him? 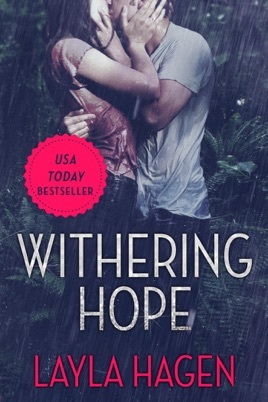 Withering Hope is a devastatingly exquisite and magnificently incredible story of a quiet, hidden love that is finally allowed to spread its wings and fly. Even though this love wasn’t spoken, seen, or shared, it was determined to let its light of warmth, hope, and encouragement shine onto the one whose heart it longed to consume. Little by little, the bricks and stones keeping it out were whittled away, and at its first opportunity, it rushed in and swooped the object of its affection off her feet and straight into the arms of a love she never knew even existed. The next step is such an easy one when we are cradled in a world that nurtures such a love, but when the real world comes crashing down around us, the true impact of that love can either lift us to the heights of Heaven or send us crashing to the depths of Hell. Amiee is happy with her life. She is a successful lawyer with a promising career, surrounded by loving friends, and planning on marrying her best friend. Unknown to her, fate is about to turn her world upside down in more ways than she can ever imagine, and all she can do is tag along for the ride. Tristan works as a driver and pilot for Amiee’s fiancé Chris. He also works as Amiee’s driver when the need arises. His past is dark and chock full of secrets that he would love to forget or even better permanently erase, but he knows that’s now how it works. While working for Amiee, he finds himself inexplicably drawn to her even though he knows she is strictly off limits. His heart just won’t let her go, and so he falls in love with her in silence. The upcoming wedding of Amiee and Chris is quickly approaching, and Amiee asks Tristan to fly her to Brazil where the wedding will take place. Fate can sometimes be painfully cruel or, if we are lucky, beautifully kind, but either way, its methods are usually unconventional and permission is never required or even asked. Needless to say, this flight has life changing implications that are far-reaching and give new meaning to the phrase “The best laid plans of mice and men often go awry”. Utterly mind-blowing and completely brilliant! These were my first thoughts whenever I finished reading this amazing story of finding a soul changing love in the midst of chaos and fear. My heart hurt as I found out more and more about Amiee. Seemingly happy, she was in fact quite the opposite. She just didn’t see it until Tristan held a mirror up to her heart. As she grappled to come to terms with this revelation, she began to see Tristan with a different set of eyes. He was no longer just her driver and pilot, he was a man full of mystery, gentleness, and confidence. Through their struggles, he never looked down on her, but admired her more and more for her inner strength and longed to revive the part of her heart that he saw in pain and ruins. She, in turn, longed to unravel his past and in so doing, her kind soul began to heal him one encouraging word at a time. They were so perfect for each other, and it was only their current circumstances that allowed them to discover the missing piece of their soul in the other. To experience and feel that kind of completeness must be absolute Heaven and the most worthy cause to fight for. Layla Hagen is most definitely a master at pulling you mind, heart, and soul into a story and then just when you think you know what’s going on, she slowly and excruciatingly pulls back the vale to reveal a life-altering tapestry whose beauty knocks the wind from your lungs, whose light blinds you instantly, and whose revelation destroys and then rebuilds you until you no longer recognize who is looking back at you in the mirror. Mere words cannot express the magnificence and brilliance of this truly unforgettable journey that will completely wreck your heart and then quietly and painstakingly remake it into a beautiful work of art. This book is by far the best that I have read this year, and I have a feeling that it will remain at the top. This is not your average romance book. It far surpasses the romance genre and slowly wanders into the truly life changing arena. Probably one of the best books I have read in an extremely long time. I had such a hard time putting it down and the ending left me in tears! This has a fast paced, original storyline. I couldn’t put it down. The characters are complex and realistic. That combined with the unusual circumstances they are put in, make for a great read!